It may look like Captain Chip Billingsworth, Esq. is just lazing around the office every day. He takes more cat naps than any other employee. 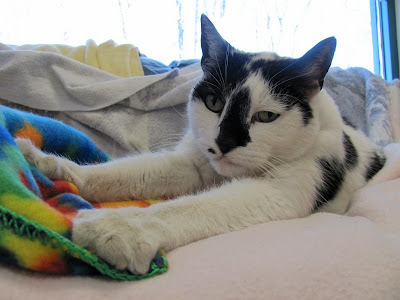 But as reported by ZooToo, Chip actually has a very important desk job as spokescat for the Dakin Pioneer Valley Humane Society in Springfield, MA. 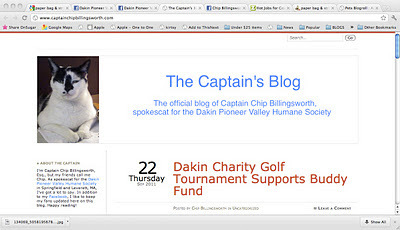 Chip, a former stray kitty, has his own blog, The Captain's Blog, as well as a popular Facebook page. He reports on recent shelter news to his friends and fans. One of his posts "Older Animals Need Love Too" talks about the mature cat and dog residents of the shelter who are looking for their forever homes. 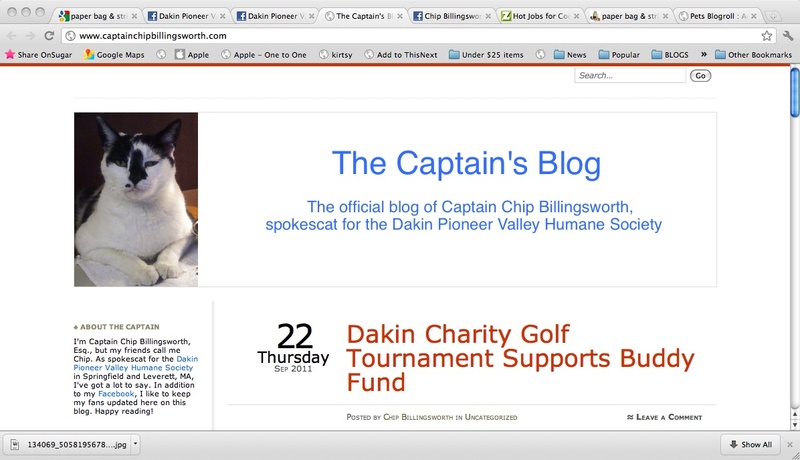 Chip's blog for the Dakin Pioneer Valley Humane Society. Here is a video of Chip in his plush office. He loves to chat! Check out "Hot Jobs for Cool Pets," on ZooToo and meet other animals who have unusual careers. Chip is a real cutie and has a great job! They are lucky to have the good captain aboard! He even looks like a writing cat - check out those paws! Awwwww...it looks like Captain Chip is a polydactyl! He has a lot of purrsonality too. Oh how cool! I like Chip! Chip is such a handsome kitty! And how cool is that he has his own blog :-) I love his plush office...looks very comfortable. I wish I could work in such relaxing environment! Chip sure is handsome, and what a great and important job he has! Chip's office is amazing...can he get me a job? !